Former L.S.A. President and Founding Member. Location & historical notes: Off San Francisco, 8.6 miles and 244 degrees from the Point Bonita Light. The station marked the approaches to the main ship channel into San Francisco. 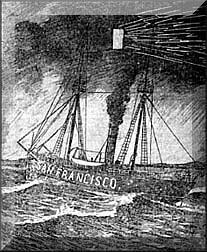 The original station position was described as being "3 1/4 miles outside the bar in 109 feet, with Alcatraz and Fort Point lighthouses in range." 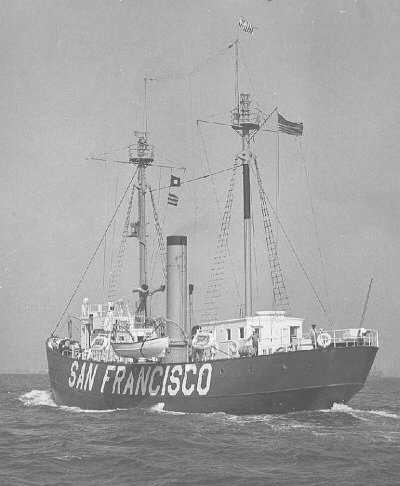 The station was replaced by the San Francisco lighted horn (LNB) buoy "SF". Note: The first use of wireless on the West Coast was in August, 1899. The arrival of the troopship Sherman was signaled from the San Francisco lightship to the Cliff House. 1904: Reverted to electric operation "now showing 2 fixed white with eclipses"
To See a picture of the Ship with armament. credentials, and means for prosecution of his voyage to the Pacific Coast." 1984 (September 26) - 1985 (February 2): proceeded to southern waters and participated in exercises to evaluate her suitability as a support vessel for surface effect ships and patrol cutters engaged in law enforcement operations. While conducting these exercises, she towed a disabled Coast Guard surface effects ship to safety after the former drifted close to Cuban national waters. She was relieved of the tow just outside of Miami harbor. * Despite this success, however, the extent of modifications required for the lightship to perform as a support vessel were not considered cost effective and the vessel returned to Boston. SUBSEQUENT DISPOSITION: Decommissioned Mar 29, 1985; sold to Boston Educational Marine Exchange Jul 7, 1985; to be given pseudo name "Boston". Returned to GSA due to financial problems. Acquired by Boston MDC, to be placed on display at Georges Island, Boston Harbor. 1950: BOSN-1 Fred L. Finlay commanding officer upon commissioning of the ship 18 September 1950 at the Coast Guard Yard, Curtis Bay, Maryland. 1950: LT James E. Flemming relieved BOSN Finlay as voyage commander on 3 October for the trip to the West Coast. BOSN Finlay remained on board as executive officer. Back to Lightship Stations and the Ships that Served on them.